The Yamaha L Series LJ16 Jumbo Acoustic Guitar is a curvaceous beauty that looks as good as it sounds. Crafted with a solid Englemann spruce top and solid rosewood back and sides (same materials used in the more popular Yamaha LL16), the depth and tone of this lovely lady will leave you amazed, especially when you see the price tag. The curvy shape of the LJ16 Jumbo makes it easy to hold and handle and, with a wider neck than many guitar models, this is an excellent choice for those with bigger hands or thicker fingers and is not as hard to manage as the deep-bodied dreadnoughts. It is still a big guitar, however, and can be a bit much for the more slightly built player. Thanks to the solid wood construction, the LJ16 Jumbo has a richly sweet, rounded tone which belies its size. 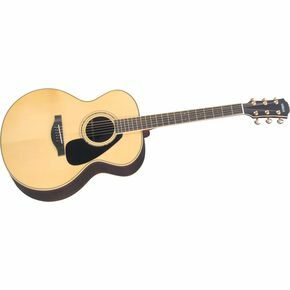 It is reminiscent of the Taylor 315 CE Jumbo Cutaway Acoustic Electric guitar for tonal qualities (though it doesn’t have the depth of range of the Taylor). But at ~$759 (including a case) it costs a good sight less than the Taylor’s ~$1,649 price tag and will provide you with years of playability without having to auction off your firstborn child. Of course if you prefer an electric/acoustic, or simply have to have a cutaway jumbo, then the Taylor is your go-to guitar. But if you don’t mind not having a cutaway style, or for a pure acoustic jumbo, the LJ16 will do you well. The Yamaha also has very smooth playing action that lends itself especially well to finger picking and flat picking alike, though it will go out of tune sooner than the Taylor, especially with aggressive strumming. However, if treated with consideration you will be pleasantly surprised at the depth of volume and the projection that you get with the Yamaha. What a great guitar the LJ16 is - wonderful solid woods and finish, and a great balance. Better than many guitars costing three times the price. I would say it's the best acoustic guitar I have ever played. Good axe for the money....solid wood ROCKS!